Meet Tom, he joined the team early in 2017 and is our most senior Segway guide. Coming from Adelaide he took the opportunity to start a new career in guiding after extensive overseas travels. Touring other countries gave him an increased appreciation for what we have here in Australia. When he returned he sought out the opportunity to give others the same positive experiences he had abroad. Tom is also an avid photographer. The iconic landscape around the Uluru-Kata Tjuta National Park is a source on constant inspiration for him. On his days off, when he’s not planning his next adventure, you might be able to find him in the park, searching for new ways to capture the beauty of Uluru. Or in town on a sand dune as he tries to get that perfect shot of the sun setting over Kata Tjuta. With his eye for photography you can trust Tom to help you get the best shots of the rock from up close while you’re on tour. So why should you join Tom on a Segway tour around Uluru? 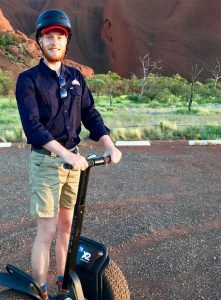 If you want more information about how you can join Tom or one of our other amazing Segway Tour guides on a tour around Uluru, click here or alternatively contact us. Get in quick though before Tom jets off to the USA.